By constantly introducing design enhancements that extend product life or simplify installation and replacement, MOOG has earned its reputation as the chassis industry's problem solver for 100 years. This pre-assembled part of premium components eliminates the need for special tools or a press, resulting in easier installation and time savings of up to 50%. 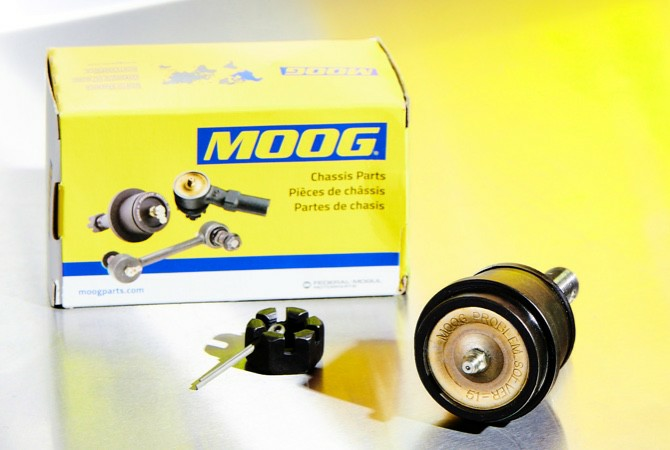 Independent testing shows that MOOG ball joints outperform the competition. And while the results may catch some of our competitors off-guard, it won’t surprise professional technicians. Shop classic and new designs from the name that's built to last. MOOG® and NASCAR® recognize the importance of safety. That’s why our engineers collaborate on the development of safety critical steering and suspension components. The NASCAR Rule Book also mandates that every Monster Energy NASCAR Cup race car be equipped with MOOG ball joints and tie rod ends. These popular bulletins provide technicians with answers to many under car concerns, offering application-specific insights and product suggestions. The complete Problem Solver library is searchable and each bulletin is available as a printable PDF. Our vehicle diagnostic center identifies what problems you might be experiencing. Get started by selecting your vehicle application.